Enjoy these Halloween treats from the PezheadMonthly.com archives. My Pez Halloween Costume: Blowin' In The Wind- I recall the time I had the bright idea to create a Pez costume out of cardboard while attending college at Niagara Falls. Lesser Candy Epitaphs- In the cemetery of fallen candies, many stories can be told. Pez Horror Movies- Just in time for Halloween, these three movies will make you lock your doors, hide under a blanket, and find comfort in the nearest Pez dispenser. Petey O'Jay- Pezhead Monthly's noble hero goes trick or treating, with less than optimal results. The Flip Side: Would a Pez Dispenser Make a Good Horror Movie Villian?- Angry Pez and Cool Pez duke it out. Editor's note: this is the closest this publication has ever come to The O'Reilly Factor. 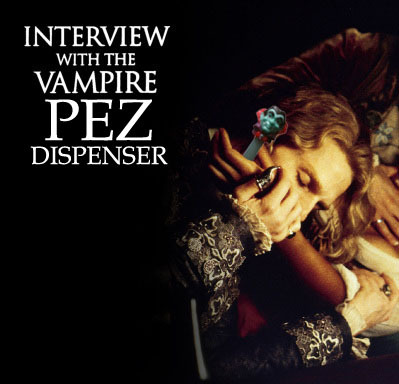 Interview With a Vampire Pez Dispenser- Fangs for the memories! And finally, Egg Baby Pez Will Haunt Your Dreams. Blood and guts don't make me queasy. Nor do bats with flapping wings. Fail to bring a sense of fright. Do nothing but amuse at most. Are not among the fears of mine. But no more Pez? Now that's a dread! Such eerie thoughts invade my head! There's no more orange… now this is scary! At stores, garage sales, all around. No more eBay- dare I mention? I cannot lie, I'm deathly scared! It won't be in the midnight hour. Not even leeches on my skin. "I'm sorry, son, there's no more Pez." Trapped inside of a Pez bag! No fingers to remove the wrap. I was of plastic, paint, and springs. I only heard this in my mind! With gazes I knew all too well. When I am on the discount rack. Told nothing of the pain within. And then my fear did multiply. A Pez, identical to me! And yet I felt so cold, alone. Instead of me, he was selected. What injustice, o what offense! Or see myself going away. Hoping things weren't as they seemed. I freed my Pez from all that plastic. For I had felt their lonely pain. And sold them on the Internet. The horror of my Pez nightmare. Pour that candy all around. Maybe, too, some Bottle Caps. Oh this might take a while. Dressing up to scare and fright. But something else is more worthwhile. Is that some Pez? Indeed, a smile. The popcorn has been microwaved. About a creature from the grave. Did you hear that? What was that noise? Something went bump in the night. Even though we're filled with fright. Until we reach the very top. As we come to a sudden stop. Oh, could it be? Is that the place? The source of horror so presumed? As we move toward that Pez room. We walk in further to inspect. In total darkness are we left. We hit the floors with such a sound. We see the terror all around. As Pez upon this haunted shelf. Pretend it's only in your head. The 4-inch, plastic living dead. A pirate or a clown? Perhaps a king with crown? Would be a sure success. I'll stick to what I know. 'Cause that's just how I roll. A target of mean campsite hazin'. "Pezhead Monthly" is in no way affiliated with Pez Candy, Inc.
PEZ is a registered trademark of PEZ Candy Company Inc., Orange, Connecticut. Enjoy Pez, but please do so responsibly.